Looking to spruce up your place or turn a classic cabin in the woods into a modern icon? These two fun-loving designers did just that and are here to show you how it’s done! When Jason and Laura O’Dell first checked out a mouse-friendly, woebegone 1963 A-Frame at the edge of Big Bear Lake in Southern California, they swept their kids into their arms so that they wouldn’t be enticed to touch a thing. 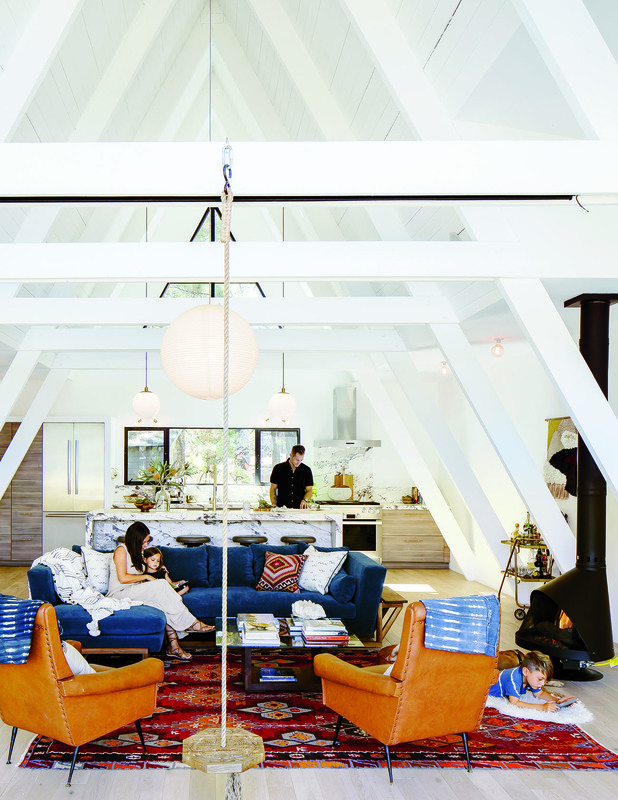 Following a major shakeup inside and out, their weekend retreat is worth risking wheel-wringing, bumper-to-bumper traffic to escape Los Angeles on Friday nights with their kids. From the moment Jason sketched the A-Frame out on a napkin, the couple knew they wanted it paint the cedar exterior black. “It blends in with the bark on the pine trees that are on the property and keeps the house very hidden from the street,” says Laura. Bold, oversized floral wallpaper in the entry adds a feminine note to the cabin’s sharp angles while acting as a prelude from the exterior. “Since our house was painted black we chose this pattern because you can see it when you approach on the path to the glass entry,” says Laura. 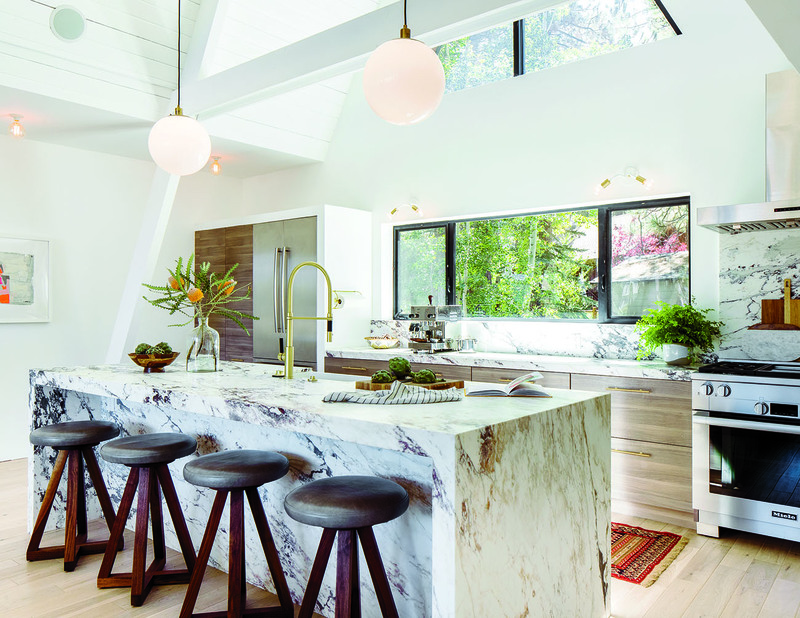 The original kitchen, says Laura, “had terrible lighting and low ceilings and felt dismal.” Jason anchored the revamped room with a sprawling kitchen island built from three slabs of Calacatta marble in a natural waterfall pattern. He contrasted the coolness of the marble with warm walnut cabinets. 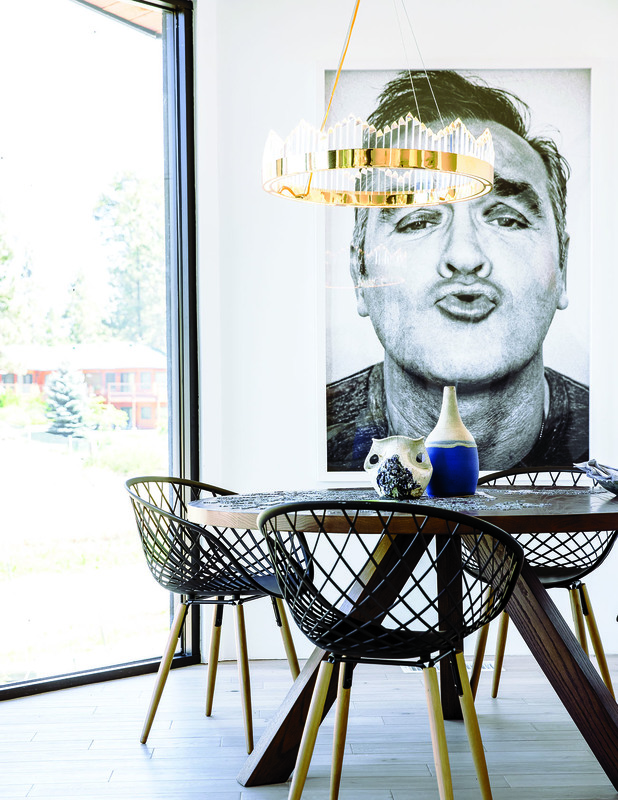 “Since it’s a weekend house, we didn’t need big bedrooms,” says Jason. To prevent the master bedroom from feeling cramped, the couple opted for a low-slung bed and vintage floating side tables. 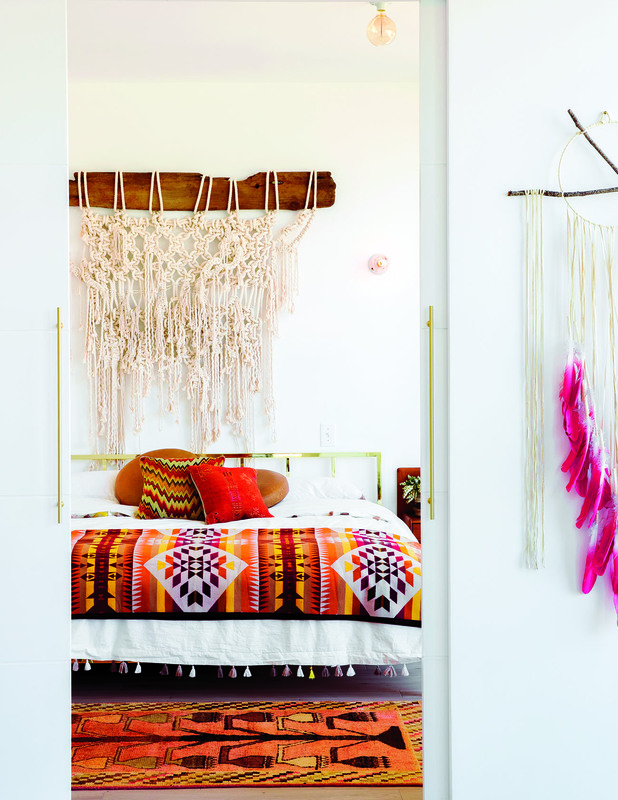 A macramé wall hanging by Emily Katz and pottery on a vintage dresser bring a boho spirit. Jason sorted through more than 100 bunk bed options for the kids’ room before dreaming up his own built-in design. The double bunk beds, constructed of plywood, include a middle console ideal for toys or an iPad and also feature a smart pair of inset, square cup holders. A white powder coated steel rail and ladder ensure the kids can get away with a little monkey business. “Since we knew we wanted to host guests often, we knew we needed two bathrooms,” said Jason. After some deliberation he decided to give one bath “the best tub you could ever want” and to create a large shower in the other bath. 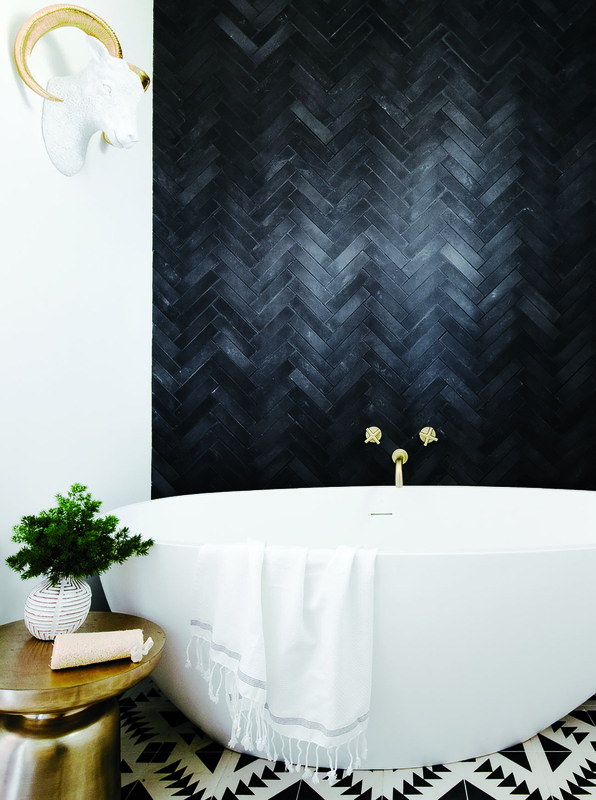 Now the tub, set against a wall of black chevron tile, reintroduces the dark moments from around the house in a memorable way. 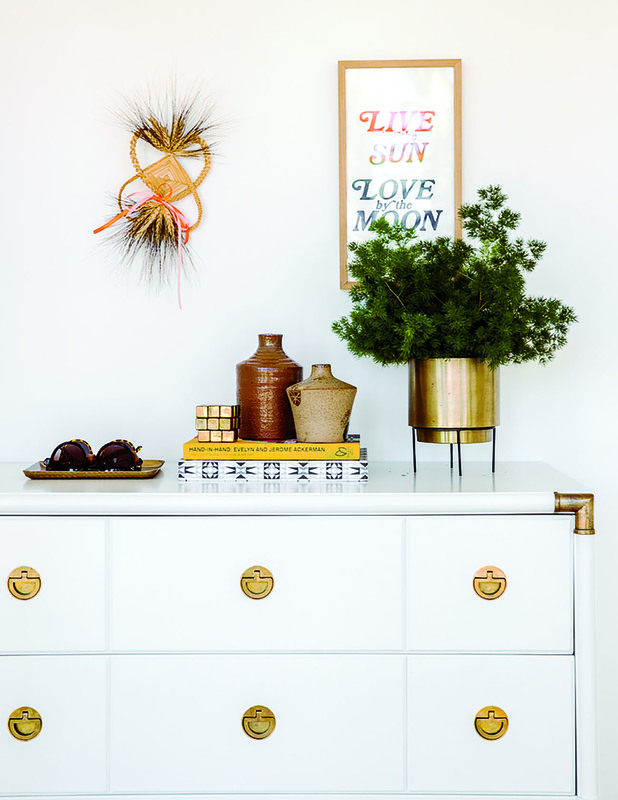 A modern macramé wall hanging is a soft contrast to a hard-edge vintage wood and brass bar cart. To keep the dining room table nook from feeling congested, Jason elected for chairs that make the space feel open, paired with a custom tripod walnut table from Studio Hus. Laura instantly fell for this impactful, smooching Morrissey image by photographer Michael Muller, who Jason assisted early in his photography career. “I’ve been a big Smiths and Morrissey fan since high school,” she says. 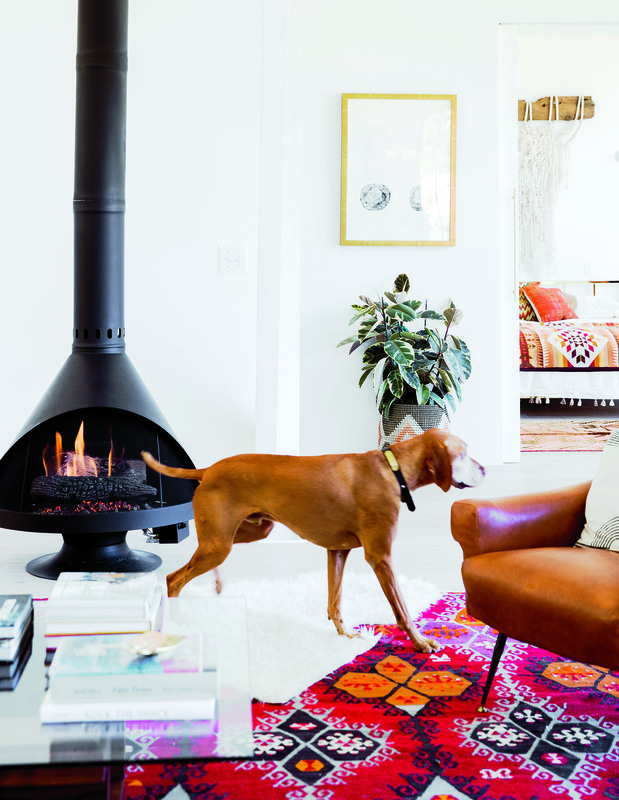 A freestanding mid-century fireplace is in keeping with the cabin’s roots and adds architectural dimension to the living room. The couple nixed the original loft but extended the ground level, altering the A-frame’s profile to create space for a wing of bedrooms, a wing of bathrooms, and a large area to entertain. To maintain the open feel they opted for pocket doors with modern hardware and for art, simple textiles. “I didn’t want guests to feel like they couldn’t relax and that their kids couldn’t jump on the furniture,” says Laura. So in the guest room she created a warm, layered space with a vintage wall hanging and overstuffed pillows that she originally sourced for their shop, The Odells. The benefit of those exposed beams? It makes the ideal spot for hanging an indoor swing.